What feels better than a good night’s sleep? If your employees aren’t getting great sleep, chances are there’s a dip in productivity along with increased moodiness, forgetfulness, and irritability. Create a quiet space for employees to take a nap in when they need a little energy boost. Comfy reclining chairs and yoga mats in a darkened room makes the perfect environment for employees to catch a few ZZZs. For adults 26-64 years old, the National Sleep Foundation recommends 7 to 9 hours of sleep per night. Ben & Jerry’s, Google, and Zappos are a few pro-nap companies that believe in the power of a good nap for employees who are under the weather or just plain tired. Most employees spend 40 hours or more a week at work. Why not make some of those hours focused on healthy fun, too? At the start of each month, set up a health challenge for your team to boost morale and health. Health challenges don’t have to be time-consuming to plan or implement. Send an email promoting the challenge, hang up fliers, and bring it up at a staff meeting. Ready, set, go! Promote health screenings year round. Send reminder messages through numerous communication methods: via email, bulletin boards, texts, and any other ways your employees prefer. Regular health screenings can catch issues early on when treatment costs less and is easier to manage. By catching health problems early, employees can handle issues with a lot more ease — and less time off. If your office is near a massage school, consider contacting the director to see if massage students could provide a “spa day” to your employees. Most massage schools require a certain number of hands-on hours for students to graduate, making it a free or low-cost option way to treat employees. Promoting relaxation allows your employees to unwind and take a few moments for themselves. By offering a variety of ways for your employees to relax, it sends the message that mental health and wellness is of importance, too. Unwinding helps the mind to refocus and helps employees feel refreshed to handle the work tasks at hand. Gather employees for a learning opportunity over lunch. There’s a variety of ways to set up a monthly lunch and learn session, including presenting new company wellness initiatives. Some companies bring in special guests like wellness gurus, meditation practitioners, and doctors to present specific topics. Your topics won’t appeal to every employee. Promote each session well, and the employees who will likely get the most out of it will be the ones to show up. Helping employees achieve their healthiest lives doesn’t have to be costly or time-consuming. But small adjustments — like getting enough sleep, for example — adds up to better health over time. If employees can start healthy habits where they spend a third of their day, they’re likely to continue those habits in other areas of their lives. Something as simple as a “Wellness Wednesday” health tip via email or text can even set employees down a path of healthier habits. 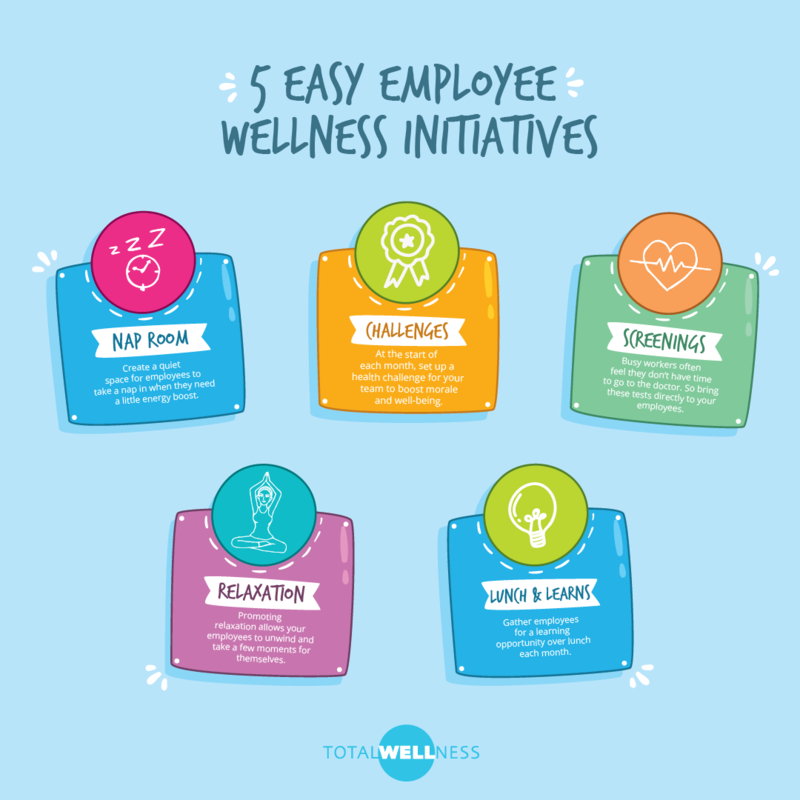 By providing these employee-centered wellness initiatives, it allows your company to start the conversation of health improvement. Plan ahead, promote, and ask for feedback to see which of your initiatives is most favored. 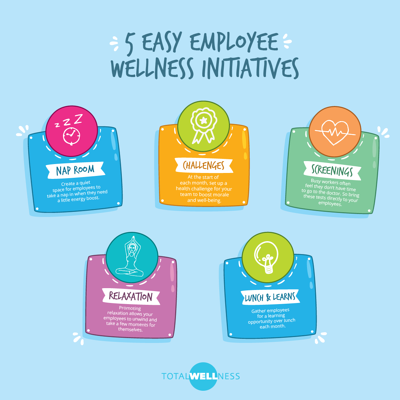 What easy wellness initiatives do your employees love? Share in the comments below!